This is your rower here, calling you to Standby. Assuming that the weather holds as the forecast suggests, and that my new AIS unit arrives today and is fitted in the next couple of days, then this Thursday 14th May morning at 09:45 am will see Happy Socks and me push off from Chatham Bars Inn pier and head out to sea on the ebbing tide. Local folks are warmly welcomed to join the farewell team and there will be a press call beforehand for journalists. Meanwhile, I am enjoying a few extra beautiful days with my favourite person in the world who flew back in to the U.S on the late flight yesterday evening to share in the final build up. Yesterday two pals and I paddled out from the beach and over the sandbar which guards Chatham, so that if the wind means I need a tow on Thursday morning, I shall be joining up human-powered dots. It was a blustery day and the contrasts between bright blue skies and turquoise seas, framed by white sands was energising. 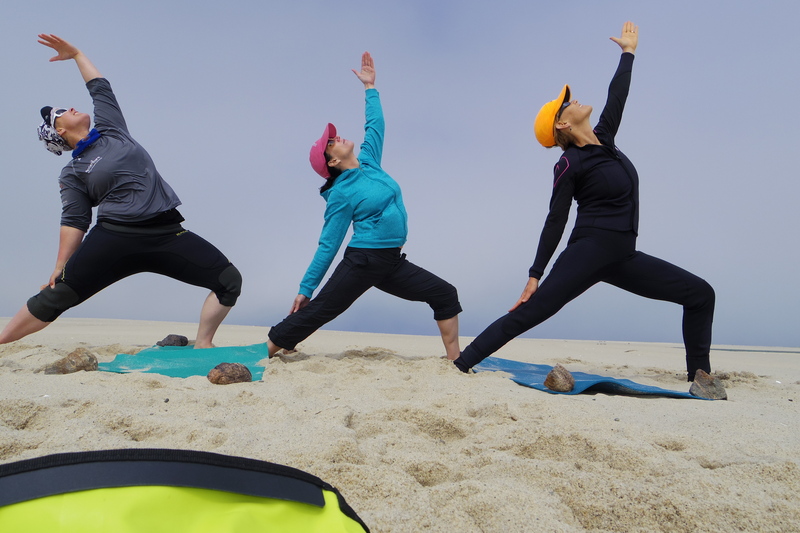 We then did yoga on the beach, saluting the sun and being blasted by sand. After a few very down days coming to terms with being apart from Lucy, I felt energised and calmed at once, ready for the ocean. The new AIS unit (replacing the one which failed last week) should be fitted in the next couple of days and then both Happy Socks and I will be ready to row. Like Lucy’s last email said, I feel fitter and stronger than I have been in forever. This feels like the time is now. Hopefully the weather picked up on that memo too. P.S Thank you everyone for all your support recently – locally, from afar, in a physical sense or an energetic one. It is a team effort to bring this home. P.P.S We need to smash these charity totals now folks – final run home. Any penny or pound will be gratefully received and put to hard work for CoppaFeel!, Jubilee Sailing Trust, MND Association, WaterAid. Donate here. What a lovely surpirise you had with Lucy coming back to be with you on this finsl leg start. We both wish you all the very salty best as you take to the water, have asked the weather to be kind and to look after you. We have folllwed you every step of the way and will continue and hope too watch you cross the finishing line as well. Hope the new unit arrives and is fitted on time for you. Row, row, row, your boat, Sarah. Godspeed to you and Happy Socks. I am still following you from the start and hope that all goes well on the final leg. A large tot of rum for Neptune and away you go. The horizon is only 4 n/miles away and after that it is all down hill. Wishing you calm seas, blue skies, and a slight breeze to carry you home. The Long Island Paddlers will be following the last leg of your epic journey. I was hoping to make a donation to speed you on your way – but I have now left two messages and no one has replied. How do you make a donation using CAF – you cannot do it through Virgin giving? All the best for a speedy and safe last leg of your trip. Apologies you haven’t had a reply – I don’t think they have come through to us. I do not know what CAF is. 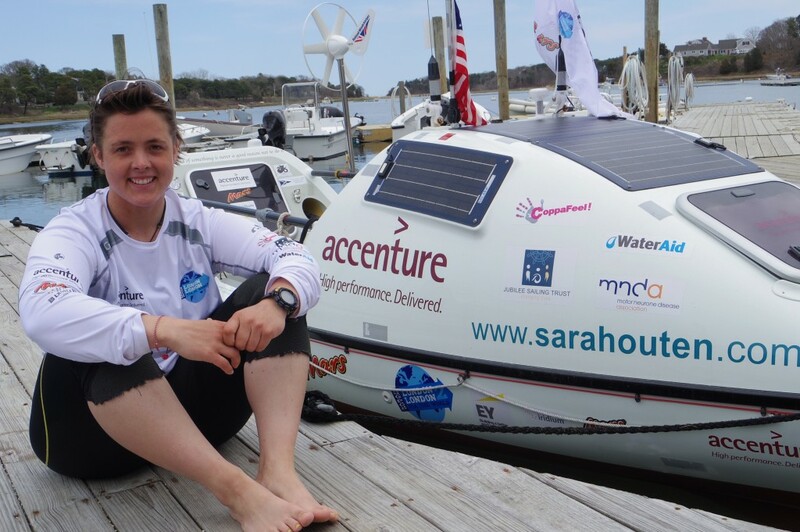 Perhaps you could email hello@sarahouten.com with some more info and someone on the team will try to help you. Virgin Online is for the charity donations via a card payment. You could also donate to the expedition funds through the Paypal link on the front page. You are an amazing person. I wish for you smooth rowing, perfect weather, and a quick trip across the pond. I can only imagine how emotional the parting for you and your sweetie will be. But every hour on the water will bring you closer to that shore to the east and to each other. As Steven said here, Godspeed to you and Happy Socks! You are ready. Go and enjoy the journey home. Take as much chocolate as you can stow. Great to meet you and Lucy and share some ice cream! I look forward to doing that again soon — at the farm perhaps. Meanwhile, may you be blessed with a beautiful journey. I will be following your progress and cheering you on. You are ready and the adventure awaits. Thank you for being a positive force in the world. We need that! Nice to read that you’re ready for the last leg of your incredible journey around the world. I wish you all the best over the big Atlantic Ocean. Looking forward to follow you progress. My friends from the North! Great to read you. I hope you are well and enjoying the open road. Best wishes for the final leg Sarah, you are an inspiration to us all !!! Raising an imaginary G&T to you tonight (actually, it’s an iced green tea, but it’ll do!) as you make ready for tomorrow! Row, Sarah, Row! 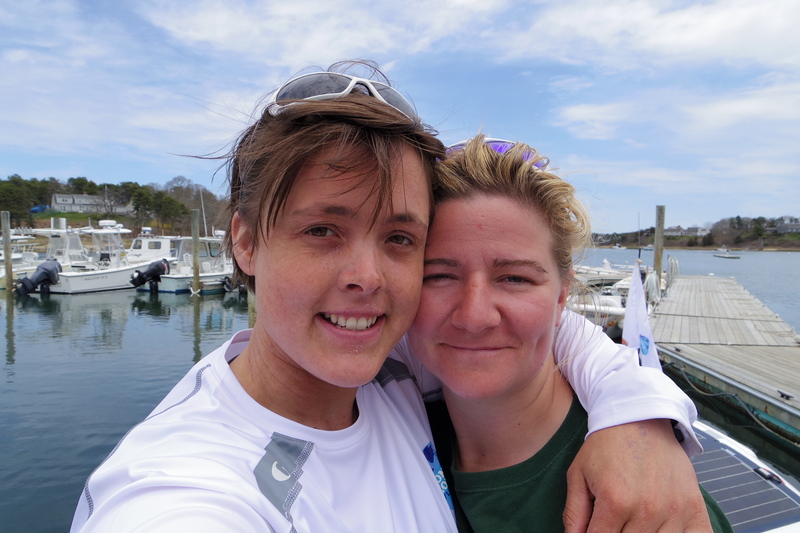 Lucy, we’ll be cheering you on as well…!! The students from the Cape Cod Charter Lighthouse School all showed up to help give you a great send off. Be Safe and may the current be with you all the way to London.